Pleasant Valley is a small community located in Southeast Portland, just north of Happy Valley. Located in the shadow of the Powell Butte natural area, Pleasant Valley provides affordable housing, rural quiet streets, and easy access to the best of Southeast Portland via several major thoroughfares including Interstate 205 and Foster Road. Powell Butte, an extinct cinder cone volcano, rises near the headwaters of Johnson Creek - an urban creek with remnant populations of native salmon and steelhead. The park is comprised of 608 acres of meadowland and forest. Pleasant Valley has much in common with other outer southeast neighborhoods, including wide streets, easy access to commuter highways, and plenty of shopping centers and supermarkets. Pleasant Valley, Portland is located on several buttes that are a part of the ancient Boring Lava Domes formation. In the mid-1800s, several pioneer families crossed the plains and settled in the Pleasant Valley area, acquiring land, establishing homesteads, farms and sawmills along present-day Johnson Creek, its tributaries and Foster Road. The Springwater Corridor occupies the original Portland Traction interurban rail bed which once carried passengers and freight from the Willamette to east Multnomah County. Residents of Pleasant Valley enjoy beautiful surroundings and opportunities to explore Johnson Creek watershed and other natural areas – all within easy reach of urban amenities and services. Pleasant Valley is a neighborhood in the Southeast section of Portland. Pleasant Valley lies roughly from SE 111th to 190th west to east and from SE Powell to SE Clatsop north to south. It is bordered by the Lents, Powellhurst-Gilbert, and Centennial neighborhoods. Near great recreation including Powell Butte and the Springwater Corridor. The Pleasant Valley neighborhood is also located near major thoroughfares such as Hwy 26, Foster Rd. and I-205. Pleasant Valley neighborhood homes run the gamut of twentieth century home styles, from craftsman bungalows and Tudor cottages to mid-century ranches and modern town homes and apartments. Most houses are much more affordable than the Portland city average. Real Estate in Southeast Portland has been booming in the past few years, and the Pleasant Valley area has kept its working-class charm and accessible attitude. To search for homes for sale in and near Pleasant Valley Real Estate, check out the McDonald Group Realtor's Portland Real Estate map search. Springwater Corridor: SE Ivon St to Boring, OR, 3.30 miles. The Springwater Corridor, a major portion of the famous Portland 40-mile loop trail, runs through Brentwood Darlington at the southern border of the neighborhood. Access to the corridor, which is perfect for biking, jogging, dog walking, and exploring, lies on the Errol Heights property, a public-use area with 3 ponds and miles of nature trails. A million people each year travel the Springwater Corridor in Gresham and Southeast Portland – it’s The Intertwine’s most-used and best-developed regional trail. The Intertwine is our connected network of parks, trails and natural areas in the Portland, Oregon and Vancouver, Washington region. Powell Butte: 16160 SE Powell Blvd - Powell Butte, an extinct cinder cone volcano, rises near the headwaters of Johnson Creek - an urban creek with remnant populations of native salmon and steelhead. The park is comprised of 608 acres of meadowland and forest. Today, miles of trails accommodate hikers, mountain bikers, and horseback riders. Abundant wildlife populates the park, including rabbits, ring-necked pheasants, ground squirrels, raccoons, gray foxes, skunks, bats, chipmunks, coyotes, and black-tailed mule deer. The park is home to many birds of prey with its open meadows, groves of wild hawthorn trees, forested slopes of Western red cedar, and wetlands near Johnson Creek. Eastridge City Park: SE 141st Ave & Crystal Springs St - Includes basketball court, paths – paved, picnic tables, and playground. During the 1990s, the Eastridge Homeowners Association and the Pleasant Valley Neighborhood Association worked with PP&R to complete a master plan for the park, which is a source of pride and common meeting place for the neighborhood. Theater ▼ Cinemark 16 Eastport Plaza: 4000 SE 82nd Ave. Portland, OR 97266 - This great theater has an "early bird" special for the first showing of the day, and the matinee hours typically run through dinnertime. They've got all the best movies before anyone else in town, and have a pick-your-own candy bar, like the Sweet Factory! Golden Dynasty: 11128 Southeast Foster Road Portland, OR 97266 - The food is absolutely great, portions are large and the service is prompt and unobtrusive. The lounge there is cozy and has a bit of a neighborhood feel about it. Happy hour may not be fantastic but there is always a drink special and there is a happy hour menu. The combination meals are a good deal - huge servings with at lease three various entrees (a meat, rice, and noodle) as well as tea, soup, and fortune cookie. Tina's Corner: 5515 SE 122nd Ave Portland, OR 97236 Make no mistake, this place is a bit of a greasy spoon, but the best greasy spoon I have eaten at in many years! Awesome homemade food, great gravy and hashbrowns. Friendly service, big portions and very fair prices. Just a little neighborhood diner that is family owned and has homebaked bread and pies - every area needs a place like TIna's! The Takahashi: 10324 SE Holgate Blvd - Home-style food. 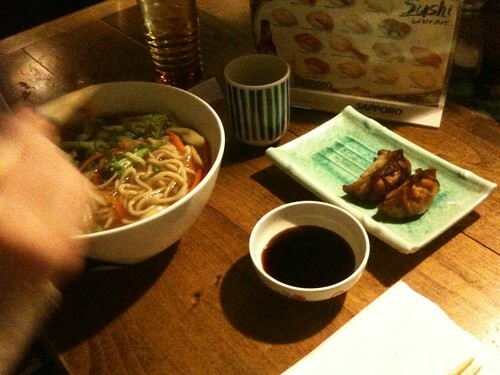 In this case, yummy Japanese home style food—noodles, rice dishes, teriyaki, tempura, and of course, sushi. Cashwise, this is one of the cheaper sushi joints in town, and cheaper yet if you go on Wednesday, Saturday or Sunday. Tomatlan Mexican RestaurantAddress: ‎: 12111 Southeast Liebe Street Portland, OR 97266 - Great, inexpensive Mexican food!